7.30pm Saturday 20th April at Staple Village Hall. Weds and Fri at Eastry at 8.30am. 5pm Thursdays at Hillside, Hay Hill (Anne Platt 695046). at 33 Boystown Place, Eastry. All welcome. 10am - 11.30am Tuesdays Weekly in Woodnesborough Village Hall. 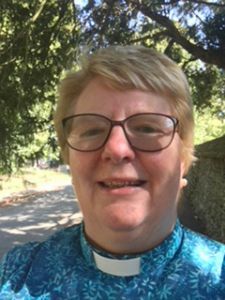 Sandra Marsh was ordained as Deacon in Canterbury Cathedral on Saturday 30th June and has joined the Benefice as Curate, living in Woodnesborough Vicarage. Sandra has written a brief introduction about herself. I come from Northern Ireland but have lived in Cranbrook for the past nineteen years. I have played an active part in the church and other local activities in and around the town. I am married to Simon and we have three grown up children and one grandson My career to date has mainly been in the education sector, most recently as a teacher and senior manager in an international school near Hastings. I have also worked in heritage tourism, especially at the Kent and East Sussex Railway at Tenterden, and my other interests include squash, swimming, gardening, reading and sampling wines. After a lengthy selection process, my training for ordination at St .Augustine’s College at Malling Abbey started in September 2016 and has just been completed. Part of the training has been working three days a week in the benefice of Headcorn and the Suttons where I have begun learning through practical experience to fulfil many of the tasks of a Vicar. So far, among other things, I have set up a Mini Messy Church and a Stay and Play for mothers of preschool children in St Mary’s, Sutton Valence. Whilst this is in its infancy the signs are good that it will grow. I have also been visiting the Beavers and Cubs in Sutton Valence and have enjoyed helping them with badge work and campfires. Whilst I feel energised by young people I have also found great inspiration from the elderly. It is a privilege to hear their stories and wisdom and I have learnt a lot from them. Simon and I look forward to meeting you and I am excited to have moved to Woodnesborough to share in the ministry of the benefice.